I’m old enough to know the rules. This song speaks to me these days, as it has in the past, as I stand once again on the precipice. knowing it’s necessary to take a leap and take a chance. I do love that the universe offers up so many second chances. And I do feel a bit like an old timer as I suddenly find myself left behind by the generation that was leading my way. I just attended one of the last funerals this past weekend of that generation before me. It is a wake-up call, sadly. Joking aside, we are bombarded with information that teaches us about healthy habits, in this day and age, more info than we could ever take in. This diet, that exercise, you name it, the internet has more remedies than Carter has Pills. (if you are young, you had to at least have heard your mom say that?!). And while I feel there is no right or wrong practice or diet probably in the big scheme, what does ring true in any genre, every medical journal, across the board, is that weight accumulating on our bodies over time is not healthy. Doggone it. So many amazing foods to enjoy which just don’t add up to a healthy number. And believe me, it’s all about the numbers, as my doctor recently told me in no uncertain terms. All that said, she’s right, so I can’t fault her. She’s doing her job and that’s what I’m paying her a lot of money to do. At the end of my visit, we agree to a six-month separation… after which I will be given a second chance to give it all and get it right (numbers that is, Kenny Loggin’s lingo). In six months, the doc and I will have a follow-up appointment . And I’m just hoping she’s able to say, great job, numbers are all down, no need for meds. Actually not just hoping, I’m counting on it. Joking aside about her bedside manner, I appreciate her frankness. It’s important we do the same with ourselves. We need to have the courage to look at ourselves clearly and honestly, and at the same time nurture and love that amazing self, never stop reinventing ourselves, and bottom line, just take good care of that gift that is you. We are all God’s masterpieces. There will never be a finite number of beautiful flowers in the garden … and the garden would be so dull if it were only filled with one type of flower. If there’s something you need to do to help yourself, don’t be afraid to turn and fly away. And don’t wait for the breeze. Today might be the day God is busy with a disaster somewhere, especially given the climate changes at this time. Decide on your own what you need to do to get it right, and I’m certain God will be the wind in your sail. Till we meet again. which will be early next week. Tonight is my meet and greet with my fellow students and we have guests coming for the weekend and a winery visit, so next shot at my computer will be late Sunday.. Can’t wait to tell you all about it. And from the bottom of my heart, thanks for all the responses and comments. They mean more than you will ever know. It takes a village, right? Working full time and trying to navigate this new endeavor doesn’t leave a lot of time to respond to each and every comment, but believe me, I read them ALL and LOVE them. 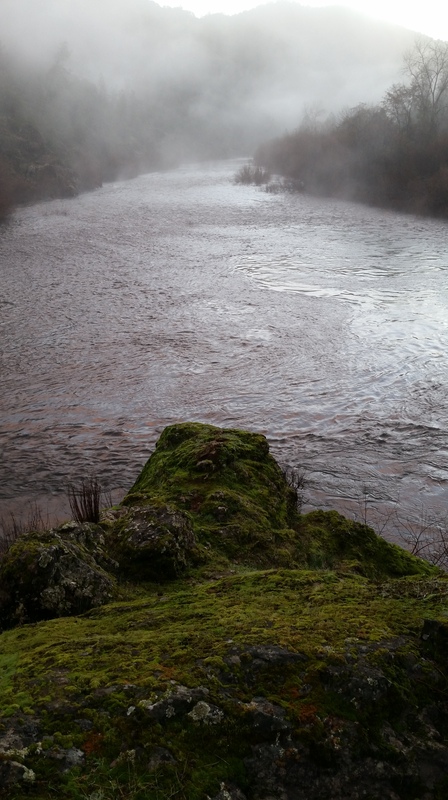 Photo Info: Picture was taken by my step son, Matt, of the American River on one of his hikes. I love the essence of this photo. It’s perfect for this journey, a beautiful river leading downstream, the mist limiting your view, but the promise of something pretty amazing beyond.